Fey do not forgive, and they do not forget. A half-breed born under a death sentence in the New World and saved from execution in the Old, Rafael West—half-elven druid turned gunslinger—returns to his homeland, wary and beholden to the high fairy who negotiated his release. To repay his debt, West is forced to protect and champion a dwarven railroad laying poisonous, cold iron across the wild lands of the fey continent, which means he’ll have to face the very elven tribesmen that want him dead for the crime of "stealing” their magic. If Big Iron stops its march across fey land, anyone he calls friend will die. The woman he’s trying very hard not to love will die. One wrong move will plunge the entire continent into full scale war. West will need more than six-guns and luck to survive. He’ll have to lie, cheat, and steal, but even that may not be enough once the secrets start to unravel. The fey aren’t the only ones with secrets to hide. 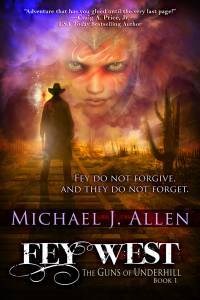 MICHAEL J. ALLEN is a bestselling author of multi-layer science fiction and fantasy novels. Born in Oregon and an avid storm fan, he lives in far-too-hot-and-humid rural Georgia with his two black Labradors: Myth and Magesty. "A non-stop action adventure.” – USA Today bestselling author, Craig A Price Jr. Neither do gunslingers, though by the Mother I wish I could. The heavy thrum of the dwarven steam wheeler’s engines slowed. Its two great paddle wheels splashed, throwing pungent sea spray skyward. Halfway through a sixth foot—an easy barrel-tilt headshot from the hip—he stood a head shorter than I with a still-thin beard that matched my unshaven chin. His thick, salted-brown brows rose in question. "Captain wants a word in his cabin before you depart.” He closed the door before I could answer, taking with him the smell of burning coal stacks. In his cabin. My gut twisted. My last visit there hadn’t been a happy one. Staring down at my steamer trunk, I realized how little I’d appreciated the freedom to walk around unarmed while we’d been at sea. Beneath the trunk’s lid, my revolvers and gun belt coiled atop my be­longings like a rattler. I reached in, careful for the moment not to touch the six-guns, and slung my rig around my waist. It weighed more than I remem­bered—an anchor around my hips. Practiced fingers traced the belt, each empty loop feeling like a hole in my soul. Only a last few magicked blue shells remained with neither white nor red to accompany them. I’d have to seek out Alexander for more. My smile blossomed. Not everything about coming back is bad. I drew the first pistol, feeling with satisfaction the hum and burn of cold-iron against my skin. The cleansing pain was righteous, a reminder that dealing death had a cost just as my existence, my birth, had come at a cost. Mixing elf with human blood created abomination and should have triggered my execu­tion, but being a hybrid also accelerated my healing and increased my magical abilities. I checked the guns’ cylinders, loaded and holstered the first gun, then re­peated the process with the second. Next I shrugged into the reassuring weight of my brown leather duster. The letter in my shirt pocket weighed more than any paper had a right to and filled my gut with angry sprites. The paper’s contents sickened me like cold-iron poisoning. True, the letter’s writer had somehow reached across the ocean and saved me from a pyre. This mysterious benefactor had ar­ranged my release and my passage and convinced my jailors to return my confiscated pos­sessions, including my steed and companion, Pixie. Sorrow, anger, and unease joined the warring sprites. My last visit to the captain’s cabin had concerned the unexplained fire in the steamer’s hold that had cost Pixie’s life. The loss of yet another dear soul in my life left me only an aching void and melancholy memories. Tragedy aside, I owed my benefactor. Owing a debt rankled my pride. The debt not only left me a slave beholden to another’s desires—leaving me vul­nerable to worse than mortal danger until the debt was honored and all accounts squared. It loomed, proving my inadequacies as a man grown and shaming not just me, but my former master’s teaching ability. Yet another unjust mark against old Halen because I owed the debt to a powerful fey. Slammed doors, dragged luggage, and excited chatter roused me from my thoughts and announced passengers preparing to disembark. Of course, they’ve reason to be excited. They’re not returning to a land filled with hateful fey who want them dead just for being born. I tied back brick-colored hair. The ends of my wavy hair curled up behind the leather thong like a gnarled claw. No matter. I settled a wide-brimmed hat in place and didn’t bother to check my pointed ear tips in a silvered glass. I’d hidden them all my life. Had they been merely rounded like other druids censured and forced to live on Elmglade reservation, I’d have at least enjoyed restricted if peaceful freedoms. The merest glimpse of their slight point marked me half-blooded and carried a death sentence in the Old World as they did here in the New. Not shaving had hidden the angular whispers of my elf heritage while in Norse Europa. A moment’s inattention, not my chin, had cost me the solace I’d sought across the sea. The single slip of ears saw me beaten, incarcerated, and sold into a wizard’s dungeon for his experi­ments. Breaking my chains—and his skull—landed me in jail and destined for a pyre until a powerful fey upended my death with debt. The dwarf crew’s docking song rose in passion until the beat energized me. I’d heard it on the voyage to the Isles of Gaelic Britannia too. The crew stomped a beat with heavy, steel-nailed boots. Joyous voices rang out in cele­bration of their task. Their camaraderie pulled a corner of my mouth upward, but envy of their brotherhood kept the other corner from rising. The song’s end beckoned me up on deck. Picking up my tack and sad­dle, I emerged from my stateroom into the harbor’s pungent salt air. Burnt coal filled my nostrils. Despite lingering scents, coal stack exhaust no longer marred a cloudless, blue spring sky filling the horizon. Gulls argued above. A creative jibe from one to another threatened to lighten my mood. A smile wouldn’t do for whatever the captain had planned for me. I strode across the treated oak planks around a long line of passengers. I climbed up one deck with a steadying hand on a smooth oak railing and its brightly polished copper edging. I paused outside the captain’s stateroom, delaying the inevitable by scanning the unwashed Baltimore docks and its swarming byways. The harbor district teemed with crates, passengers, and workers. Mule- drawn wagons trundled away heavy with cargo bound for wharf warehouses or down stone ramps into the underways. The dwarven craftsmanship, which had carved out the city’s dozen descending stories of the underways, demanded respect even from a druid who preferred forest and open sky. That the whole structure remained bone dry to the harbor’s edge left me in awe. A stone wall arose just beyond the warehouses and amenities, the fey, and visiting humanity. Intricate carvings reminded human visitors in gruesome, masterful detail of their failed attempt to invade lands to which they’d exiled all fey. The wall also marked the boundary beyond which Old World humans were fair game to any fey that wanted to spill their blood. "More or less,” he said. I moistened my lips. The boy’d caught sight of my ears. The desire for my murder had obsessed people like him as long as I could remember, but he’d hurt an innocent animal. My hands burned against my revolvers. What would Halen have wanted me to do? Would he have forgiven an attack on Pixie? I eased my hands away from the cold-iron. "Only that he was about his master’s business,” he said. "Good day, Captain.” I exited. While I waited my turn to disembark, I scanned the harbor filled with bustling vessels. Steamship and sail offered passage over the rising and falling churns of brownish-blue waves to parts unknown. Do any of them journey away from all this hate? Is there anywhere I can lay aside my revolvers and be who Halen wanted? Anywhere my birth isn’t a crime? My turn came at last. I set foot on my homeland, expecting to find my legs unsteady on unforgiving, unmoving stone after so long on rolling sea. The feeling unsettled me less than it had when I’d disembarked in Gaelic Britannia, though my knotting stomach made up the difference. I had my bearings almost in hand when a voice shouted from behind me. I turned toward the voice of the boy who’d burned Pixie to death in a confined space she’d had no hope of escaping. He’d changed from the simple traveling clothes into a purple robe embroidered with ludicrously compulsory reddish-silver stars of an Old World Council Wizard. The robes, which were actually midnight blue beyond the red hazing of my vision, hung loose on the gangly youth. A silver braided belt cinched the robe shut with a pair of hawthorn wands hung in dueling holsters. I knew his type, had heard like zeal and hatred before. Dissuading him from his dreams of besting me in a grand showdown was almost hopeless. The angry boy Halen had taken in after his mother’s murder didn’t want to stop the fight. He wanted to feel the cold-iron burn—the right and just price of bal­ancing a life in my sights. As much as the young Rafael West might hunger for blood and ven­geance, the older if not wiser me didn’t want any more of Halen’s disap­pointment weighing on my soul. I searched the mageling’s gaze, looking for a chance to save the both of us. An uncomfortable reflection lit the boy’s expression. My eyes fell to the twisted, bejeweled wands at his sides, and understanding slapped me, right cheek then left. His master had tortured me with the very same wands. Vengeance doomed peace. Youths with power possess no end of arrogance, yours truly included, once upon a time. A shake in his hands made his accusation more about enraging me to action than calm insult. A sudden hush drew my attention to human and fey bystanders who had stopped to witness whatever came next. I really didn’t want to kill the kid—all right, the same part of me that deplored his dedication to his miserable teacher did want to kill him—but if he insisted on dying, at least wands would give him a semblance of a chance. After the Wizard’s Council of Gaelic Britannia exiled the druids, they’d started to abuse the power vacuum. Gnomes like Alexander invented guns and gunpowder—the latter probably by accident—and worked with dwarves to supply those abused by the wizards. Since on-the-fly spell work couldn’t really compete with a revolver’s quick draw, the wizards created wands as a counter. Only stupid or incredibly fast wizards came against a gunslinger without wands anymore. "Very well, just a moment.” The words escaped in such a whisper I doubt he heard them. Maybe I could keep him from killing any innocent bystanders. I stepped to a patch of dirt with the sea at my back, set down saddle and tack, then reached slowly across my body. If he’d possessed a decent survival instinct, he would have blasted me then. I’d practiced firing cross body and could have put him down without effort. I removed a pistol from its holster, careful to lift it by the cylinder rather than the grip, and dumped out the load on the dirt. The iron burned my hand, but I had to reload. It wouldn’t do to fire cold-iron bullets into a crowd of fey. I slid two blue-jacketed shells into the revolver and closed the cylinder. I glanced up at him. Damn the kid was arrogant. In this kind of duel, two shots had better drop your opponent. If not, forget the third. You’re already dead. I slid in another blue and followed it with three green. I aligned a blue for the chamber, eased the cylinder closed, and holstered the weapon. I took a moment to rub cool, soothing earth between my hands before rising. I glanced around at the watching audience. Even fey, or perhaps especially fey, weren’t immune to Death’s draw. Species that lived long past many others, who saw the light of centuries dawn, were attracted like moths to flame when life was about to be abruptly extinguished. Just the same, I checked their positions clear of the line of fire. I’m sorry, Halen. I tried. I inclined my head and waited. He drew with as much coordination as a newborn foal. His left wand caught inside the slim holster. His right slid free as both ignited—one bound, burning through its holster. Two continuous flames lanced out across the cobblestones. My pistol leapt clear of the holster before his flame had traveled a quarter of the distance between us. The metal frame burned the crook of my thumb and the inside of my other fingers while the wooden grips protected my palm. I set my finger to the trigger and felt it burn along the faint scar there from countless pulls as I fired. In the hush, the gun’s report sounded like real thunder as a tiny ball of storm-struck wood, encircled by a sapphire aurora of captured lightning, streaked across the distance, and struck him in the vicinity of his nostrils. The spell’s thunderclap blasted his spark-shrouded remains backward. His flame lances jerked upward as he fell. The first lance scored my left side, burning through my leather duster and ruining my shirt. Fierce agony seared my skin. The odd odor of my burned flesh joined familiar scents of ozone and burned gunpowder. The second lance blackened only stones. Both vanished. I cursed and traced my bullet’s path. Its magic had burned out against a stone warehouse wall.